It’s not really a road map, although it does have the major routes on it. Most of us don’t use paper maps much any more, anyway, and rely on our phones or GPS to drive. 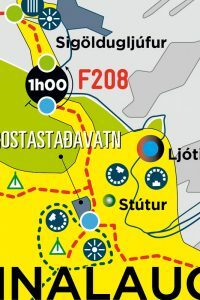 And, frankly, there aren’t that many roads in Iceland that you might even consider driving on, so the roads highlighted on the map are plenty for rough navigating and estimated distances. But the really glorious part of this map? It shows all the major tourist sites (waterfalls, caves, beautiful vistas, gardens, hot springs, volcanoes, canyons, etc) and marks the five-star places to visit. Even better? It highlights particularly gorgeous drives or areas in yellow so you can plan your route to take you through the best scenery and photographic opportunities. We basically followed this map around the whole island, heading for the marked waterfalls and viewpoints, and sticking to the yellow-highlighted routes — which never disappointed.I don’t think we disagreed with his assessment of “this is gorgeous” even once. I just wish we had the opportunity to drive into the highlands — so many things to see that were just not accessible in early May. 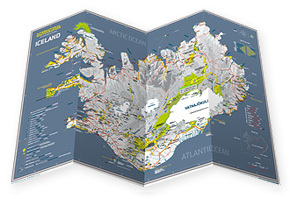 The map was developed by Michael Levy at International Photographer; he made multiple trips to Iceland to refine the map, pick the best places to take photos, and share it with everyone else. It is, at least to me, the perfect travel companion. The map promises more locations to come (Scotland, Russia, Norway and others) and you can be sure I will snap them up as soon as they are available. The map itself is almost indestructable. It’s that plasticized paper that resists tear and wear, and despite me folding it fourteen different ways over and over again, it it still in nearly pristine condition. I took along a permanent marker to track our progress, and it’s easy to mark and doesn’t smear. It’s a large map, though, and can be a bit unwieldy to use while driving. Hello! Where can I buy or get it? The link you provided, doesnt work.. it looks fabulous..